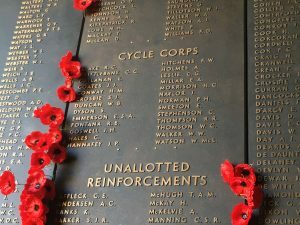 On the eve of Anzac Day (a holiday in Australia to commemorate the battle at Gallipoli during the First World War) I thought it would be fitting to talk about the role of the humble bicycle in the First World War. It’s not so much a women’s cycling story because it was men who rode the bicycles but as I have a love for history I decided to share it with you. Today, bike technology has changed dramatically from the bikes that were being used in the First World War. The steel frame bikes were very basic with no shock absorbers or even gears. 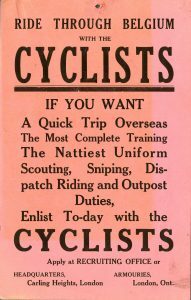 The soldiers wore the standard AIF Uniform which would have been uncomfortable and inflexible on a bicycle. It is not well known that the AIF had cycling units that were used in many of the major battles during the First World War such as Messines in June 1917, and Passchendale July 1917. These units were deployed to the front line as well as undertaking cable burying, traffic control and reconnaissance work. The bikes were issued from England and manufactured from Birmingham Small Arms Company – better known as BSA. This company was also a major British arms and ammunition manufacturer. The soldiers were issued with the standard issue rifles, which they could attach to the down tube of their bike or swing it across their back. The models of the bikes ranged from the Mark I through to the Mark IV. If you were lucky you were issued with a Mark IV. This bike had a free wheeled hub, which basically means you were able to coast without having to pedal constantly – as with the Mark I to III. Those models had a fixed hub, which in today’s terms would be called a Fixie – or Track bike which are much harder to ride. The Mark IV was also issued with a hand operated rear brake. The terrain these soldiers had to endure seems impossible to contemplate; riding through mud and rubble while under constant threat of shellfire. These bikes did not have the luxury of knobbly tyres like today’s off-road bikes, but would have been a standard military issue of little or no grip. The AIF cycling units have often been forgotten in military history but the humble bicycle played a very important role in the logistics of warfare. The simplicity of the bike made transportation quick and reliable. Even in 2008 the Australian Military were using the bicycle in East Timor to improve flexibility of field patrols with a unit called Bicycle Infantry Mounted Patrol (BIMP). Tomorrow as you leave the Dawn Service and take the opportunity for a morning ride remember our diggers both past and present. Share your stories about the role of the humble bicycle in the First World War via comments or the Women Who Cycle Facebook page. Previous Post:Help – Will cycling make my thighs bigger? Great article. my grandfather was in the cycle Corp in the British Army in WW1.